After years of negativity from fans, Jake and his family may want nothing more to do with us, and that would be understandable. Or maybe just general well wishes can help lift their spirits knowing they have the support of fans from around the world. But maybe they need more than that. I would like to invite them to let US know what THEY need. If they need privacy, they can have it. Do they just want well wishes? We have that for miles. Do they need more than that? All they have to do is ask and we will do what we can for them. At first when it seemed like this was another case of a wild weekend gone wrong or another former child actor getting in trouble, there were plenty of jokes to go around. I knew people weren’t necessarily trying to be mean, just make light out of an embarrassing situation where at least no one got hurt (though it could’ve ended very, very badly). But my gut feeling was there had to be a sad story behind all of this. Happy campers don’t lead the cops on car chases over 100 mph. Usually the driver has something to hide: weapons or drugs in the car, fleeing a crime scene, intoxication…something serious. In this case, Lloyd didn’t have a license, which is of course illegal but not worth a high speed chase. You don’t do hard time for that. As it turns out, there WAS a sad story behind the incident: Lloyd’s mother revealed he suffers from schizophrenia. Whatever his legal and moral responsibilities are in this case, at the very least we should be compassionate about Lloyd’s illness and show as much support for him as fans have shown support for Carrie Fisher after she revealed she has bipolar disorder. There’s been some discussion as to how much this has to do with bullying and the internet mob. Even though schizophrenics are more sensitive to stress and events can trigger episodes, it would be really overblown to claim the anti-prequel backlash or the crappy things fans have done gave a perfectly happy and healthy person schizophrenia. Believe me, I blame that stuff for a lot of things and while I’m sure people’s cruelty definitely didn’t make Lloyd’s life easier, nobody’s saying mean fans (and they existed) gave Fisher her mental problems either. The system still hasn’t figured out how to handle mental illness but I hope that Lloyd can nevertheless find the help he needs to get back on track. In Defense of Anakin Skywalker… Much like Jar Jar Binks, fans have been highly critical of Anakin Skywalker’s character, specifically Hayden Christensen’s acting. Critics felt he was stiff, wooden and delivered some of the worst “romance dialogue” in the world. “I don’t like sand. It’s coarse, and rough and irritating. Not like here, where everything is soft.” It may seem like the worst dialogue ever, but come on. Anakin was a 19-year old boy with zero exposure to relationships, and was awkwardly looking for the right things to say. Adolescent crushes do NOT have Shakespearean dialogue. They are awkward and oftentimes don’t make sense. It’s actually quite realistic. Anakin gets gushy later on, saying that Padme’s kiss is like a scar, and laments that he wishes he could just wish away his feelings. Don’t we all? Love hurts, and can make us feel like we’ve been cut open with a knife. Anakin was pouring his heart out, revealing the naked, honest truth. Years later, after successfully wooing Padme, he stands on a balcony watching Padme brush her hair. “It’s only because I’m so in love” she says. “No it’s because I’m so in love with you.” Anakin basically echoes her, and a lot of people criticize it as poor dialogue, but to be honest; he’s a warrior, not a wordsmith. What else could he say? Recite a well thought out sonnet? Anakin is more left hemisphere anyway. He knows how to fix things, and prefers “aggressive negotiations” over talking. All in all, Hayden Christensen captured Anakin’s character perfectly. He was an awkward boy, full of love but also full of anger. He was an imbalanced person who could be easily manipulated. He may have even been a savant, as he constructed a working protocol droid at 9 years old, yet was ineffective interpersonally. That could be indicative of high-functioning autism or Asperger’s. He had his challenges, and they were ultimately overcome thanks to the love of his son. 2) What expectations do you have for the Prequels Strike Back? 3) I know you(and starwarsdefender) are bit apphensive about a Sith as a villain for future movies, but could we have a new kind of sith not tied to the Rule of Two, and the Chosen one Prophecy be about destroying the Rule of Two? 1) In an essay I wrote years ago, I said the “bandwagon effect” was one of the main reasons why there are people who don’t like the prequels. If you see something said over and over enough times, you can start to believe it yourself especially if you had no strong opinion beforehand or if it’s important to you to be accepted. 2) I don’t know but I don’t think it’s going to be quiiiite the pro-PT rah-rah some fans seem to expect. But there are some interesting contributors involved. 3) No, the prophecy had no caveats or anything else to do with the Rule of Two. It was to bring balance to the Force by destroying the Sith. What are your thoughts on Colin Hanks’ request for more female representation in Star Wars? Why do you think there’s been more demand for female representation in Star Wars? How can we continue to differentiate ourselves from the very haters we fight against? How do we 1) explain to others why we’re different, and 2) how do we avoid proving them right by actually becoming what we hate? Those are good questions and ones I struggle with sometimes. Art is subjective and Star Wars (or any fandom) is an emotional thing for us. It just is. So it becomes very difficult not to “lose it” around people who are baiting you or around a jerk who posts something stupid on a blog or publication’s web site. But I will say this…I have never personally encountered any prequel fan who is as bad as the very worst of the haters I’ve seen. So I reject any equivalence that some people try to make. I don’t go to their sites and bother them. I don’t follow them on Twitter just so I can jump on them whenever they offend me. Some of these guys though have no problem with trying to harass, bait, troll, or flame prequel fans. Have you encountered SW fans that were not fans of the PT, but where you did not have any problems to “agree to disagree?” That is, real fans for whom the PT was not their cup of tea, and you had no problem accepting that? 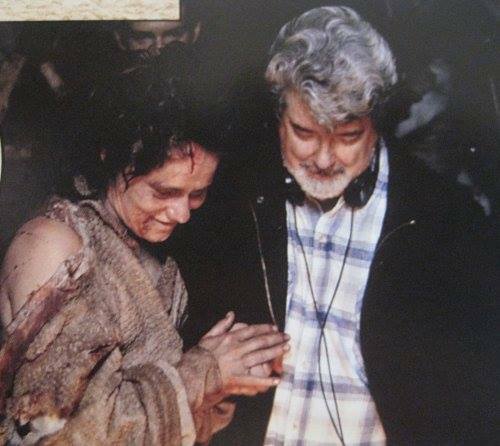 Furious Fanboys has scores of behind-the-scenes photos from the prequels. Making Star Wars.net has a report on Disney Infinity 3.0 from E3. Alice Cooper dedicated his “Legend” award from Kerrang! magazine to Sir Christopher Lee. Are you going to SDCC this year? Is one of your pals? Well, you might be lucky enough to score one of Funko’s many exclusives, this 501st clone trooper (ROTS design). If not, take heart. Plenty of exhibitors will be selling them at a markup! For a young teenager who had always felt she’d missed the height of Star Wars fandom, it was glorious. The excitement, the media coverage, just the pure amount of Star Wars merchandise available were heaven to me. I was thankfully young enough to not be jaded by TPM and I embraced the resurgence it brought to Star Wars. I was the perfect age in the perfect situation to enjoy that summer of Star Wars. You might also want to check out this one, though it isn’t really prequel-centric. The whole sequence that makes up the big climactic act of TPM is one amazing piece of cinema. Taking a cue from ROTJ and its three crosscut battles (Endor, the space battle, and the lightsaber duel aboard the Death Star), TPM goes for four with the fight with Darth Maul, the space battle, Queen Amidala retaking her own castle, and Gungans battling the droid army. But it all starts with perhaps one of the most popular moments in the film, when the queen, her handmaidens, and other crew are in the hangar with Qui-Gon and Obi-Wan, a door opens, and there’s Darth Maul waiting for them to the opening fanfare of “Duel of the Fates.” Darth Maul takes out his lightsaber and for the first time we see both blades ignited. Here’s where it gets real, boys and girls! “We’ll take care of this,” Qui-Gon says in an understated way. “We’ll go the other way,” the young queen says, wisely getting out of there with her retinue as quickly as possible. It’s a great little exchange not out of place in any of the Star Wars films. The cloaks drop—beginning a prequel tradition of dumping off robes at the beginning of lightsaber duels–and the lightsabers ignite. Maul reveals he has two blades, enough to take on two Jedi at once. This is where editing, Williams’s score, and Ray Park’s performance (which is amazing, especially when you consider he’d never really acted in a movie before) helped make that particular scene stand out. I’d seen TPM at total of 13 times with an audience and every single time, it brings cheers. Lost in the hoopla over Battlefront 2 and other stuff at E3 was EA announcing a new mobile CCG called Galaxy of Heroes. When we set out to make STAR WARS: GALAXY OF HEROES, we wanted to tap into the fantasy of collecting characters and starfighters and then let people enjoy the fun of playing with them creatively. We’re bringing this idea to life by allowing players to take part in battles with collections of their favorite heroes, characters, and ships from across the Star Wars™ universe. From the classic trilogy and Star Wars Rebels™ and Star Wars™: The Clone Wars™ animated TV shows, to the prequels films and beyond, we’re giving players a truly extensive Star Wars experience. No word on when this is coming out. It’s been a while since I’ve done an Ask SWPAS session, so here’s a new call for your burning questions on all things Star Wars!